Add : Click “Add” button, and then the following screen will be displayed for selection of applications. Edit : Select the application for the link and then click the “Edit” button. The following steps are the application selection and setting the size of the iframe, as requested in the process to add applications. Remove : To remove just select the application you want to delete in the folder, and then click “Remove”. Iframe width : Width set to be used inside the folder to display the application window, leaving 100% the application will be adjusted more easily. Iframe height : Height set to be used in the iframe to display the application window, if the it is too small, the application will create a scroll bar to the window. 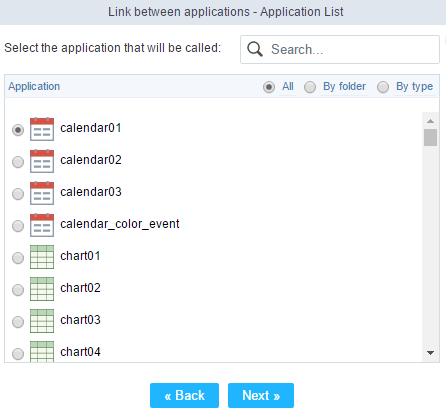 Reload Iframe : When a folder is selected the applications contained in the same run and the result is displayed, with this option turned on “Yes” when you click on the folder that contains the application cache is created with the page loaded, this cache will be used if the user browse for other folders and return to the folder that has the application with this option enabled. Variable : Global variable name where the content will be retrieved. 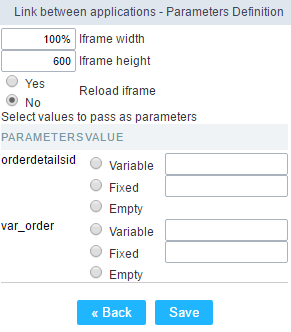 Value : Content to be loaded into the parameter at run time.